For this review I delved into the world of essential oils and even touched on aromatherapy. When I first saw the Tru Melange website, I was drawn to their scents and the unique look of their SOL Glass containers. Their use of a beeswax and soy wax blend caught my attention as well as the affordable luxury. 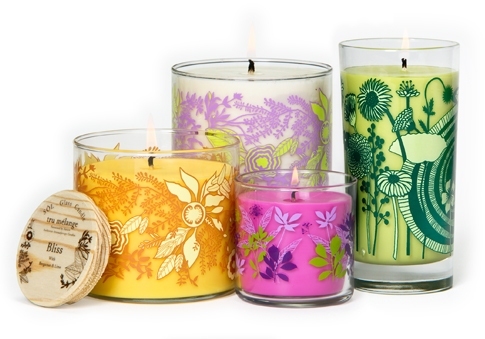 These products are reasonably priced so anyone can afford to enjoy these all natural candles. When you see their website, you’ll know why I couldn’t resist a jar or two. The SOL glass is just so pretty, I couldn’t wait to try these. 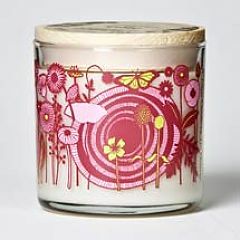 Tru Melange offers many candle styles from pillars, to travel tins, simple tumbler glass candles and even votives. The printed glass SOL collection is absolutely gorgeous. They pride themselves on a natural product from the wax and wick to the fragrance and color. Tru Melange is all about natural ingredients, and if these essential oils give our senses a little boost in a positive direction, all the better. Each one of the SOL Glass Candles from Tru Melange is a work of art. The collectable glass jars have different printed designs, depending on the scent, that you’ve just got to see to appreciate… they look so cool. To showcase the beautiful, collectable glass designs, the only labeling is on the natural wooden lids. The labels themselves are clear except for the print. I really like the look of these glass containers. They are truly unique. For this review I tried the Fresh (Vanilla & Peppermint) and Relax (Lavender & Blood Orange) scents in the largest 17 ounce size. The wax color of Fresh was white and the jar design was a pink and red flower motif. 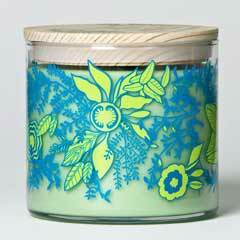 Relax was pale green wax in a glass decorated in a blue and yellow flower print. How did my Tru Melange candles smell? Tru Melange is about making natural candles. They are not specifically marketing these candles as aromatherapy. The therapeutic qualities of essential oils is just an added benefit. However, I found the scent descriptions intriguing and the skeptic in me made me wonder… Can scent really affect mood, beyond the simple enjoyment of a beautiful candle? And, if I’m skeptical, can a candle that promises optimism change my very outlook on its claims? It boggled my mind, so I tried my Fresh candle first which was said to bring clarity to one’s thoughts. After a few hours of enjoying the Relax candle, I lit my Fresh candle and set about analyzing the effects of peppermint on the psyche. After some nose time with this pretty candle, I did feel somewhat insightful and, yes, perhaps even energized. The peppermint and vanilla paired well and made for a happy, sweet, playful scent in the room. I expected the strength of peppermint essential oil to knock me out but it didn’t. The peppermint was noticeable but subtle enough to let the vanilla come through just fine. Tru Melange has got a knack for blending essential oils into some extraordinary scents. Here is Tru Melange’s description of Relax. Who couldn’t use a little extra balance and clarity of thought? I wouldn’t turn that down, and in fact used it to my advantage earlier in my review. Skeptical or not, I’m willing to give any scent a chance to clarify my mind. Beyond the therapeutic properties of Relax, what really drew me to this scent was a curiosity about how lavender and blood orange would blend in a fragrance. It seemed like a stroke of genius to put these two essential oils together. This is a beautiful fragrance. Essential oils make all the difference here. There is a purity of fragrance that I could sense immediately with this candle. If you’re looking for the most authentic scent, essential oils are the way to go. Seriously, you can’t get more authentic than the real thing. The lavender was soothing while the blood orange was rejuvenating. The two together were like a yin and yang… the perfect balance of polar opposites. How did my candles from Tru Melange burn? These candles are a blend of beeswax and soy. It’s an interesting wax and one I hadn’t experienced before. I didn’t know what to expect from this type of wax blend. These candles burned well and provided a decent scent throw. They left a thin film of wax on the glass jar as they burned down. Being soy and beeswax, the glass was easy to clean and the jars were so pretty, they called out to be repurposed and kept as keepsakes. Each jar had a single wick that kept a strong flame throughout the burn. These candles required only minimal wick maintenance. It was important to let these candles burn long enough to get a edge to edge melt pool to avoid the possibility of tunneling. The candles I tried did not tunnel. Tru Melange has the right approach to all natural candles. Their use of only 100% pure essential oils in their fragrance blends made a difference that I could smell immediately. 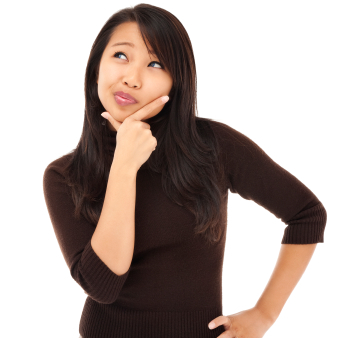 If a fragrance is to have any effect on a person’s mood, I’m convinced that it must be a pure essential oil. Tru Melange skillfully blends these essential oils together in a way that elevates them into something more…the sum is greater than its parts. It was clear that great care was taken with the wax blend, wicking and even the eco-friendly powder dyes used. Aromatherapy aside, these candles smelled really good. They moderately scented my testing rooms. I recommend these candles for their beauty, burn quality, and scent authenticity. Watch for my review of Tru Melange pillar candles coming in the near future. So long for now and happy candle burning!